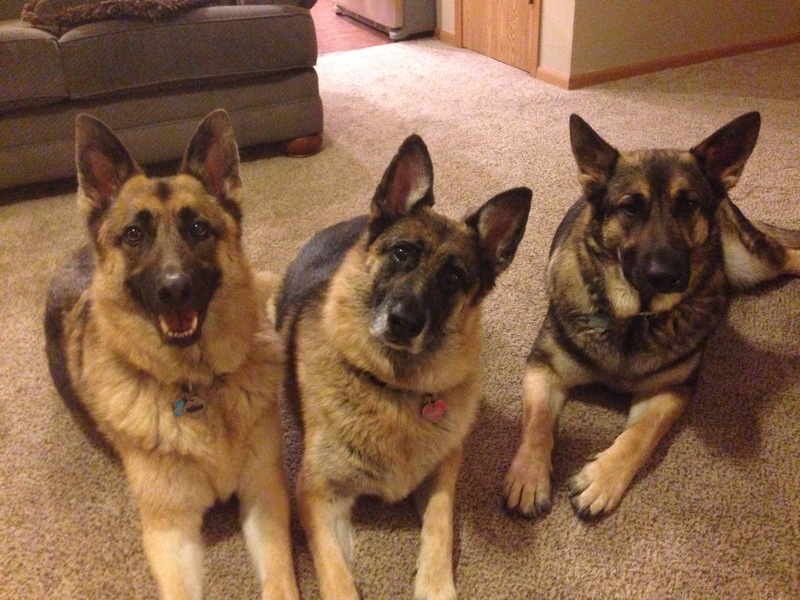 For this session, I worked with a trio of German Shepherds; Charles, May and Teddy. Their owner contacted me to stop their habit of charging the door and barking aggressively when guests knock or ring the doorbell. It took their guardian a good two minutes to get the dogs settled down enough to even crack the inside front door. He had managed to move them back away from the door a bit, but was spending all his attention and energy to corral the dogs so I had to open the door and let myself in. May had moved away from the door by the time I was inside, but Teddy and Charles were not going to give up that easily. Once I was inside, they settled down a bit, but they kept me in their eye site. Many dogs bark out of frustration of not being able to smell the new arrival. This was somewhat the case with Teddy and Charles, but there was also a territoriality to their barking and movement. Once they had calmed down sufficiently I had they guardian let them go so they could come over and give me a good sniff before I went any further into the home. As we discussed the situation, I noticed the dogs all stayed close to their guardians and later learned that they were always nearby or leaning against them. When the humans got up to get a glass of water or use the rest room, the dogs followed. This is usually the case with dogs who are a little insecure and can lead to other problems like Separation Anxiety. To make sure this behavior didn’t lead to that problem, I suggested that they start to practice the stay command. I also showed the family members how to define their personal space. Dogs have three distance markers; intimate space is a three foot bubble around the dog. This area is generally reserved for close acquaintances. The next zone is from three feet to 11 feet and is know as public space. Anything beyond 11 feet is considered public space. When we sat down on the couch to go over a few exercises, the dogs sat or laid down so that they were leaning against their guardians again. While there is nothing wrong with a dog and human making contact, when a dog has to do it all the time it is debilitating to their self esteem as the dog feels it needs to be in touch with the human to feel content. I prefer to teach the dog that it needs to wait for the human to ask the dog to come that close until it is better mannered and behaved. Climbing up on or leaning heavily against a human can be a sign of an attempt to dominate or control the human, these are leadership traits that work counter to the home life these dog’s guardians wanted to achieve so I showed them how to communicate that they wanted the dogs to respect a three foot bubble of personal space. Each time a dog walked over, the guardian made a sound to disagree with the dog’s intention to sit or lean against them. This worked some of the time. But when it didnt, I had the human stand up and face the dog to disagree with their invasion of the human’s personal space. The humans waited for the dog to sit, stand in place or lay down a few feet away before sitting back down. It took a few repetitions of standing up and making the sound, but within a few moments the dogs got the message and laid down near them, but giving them some personal space. After we completed the exercises in the living room, I turned my attention to the dog’s charging of the door. Often when dogs do this, their guardians feel embarrassed by the barking their guest hears so they rush over to the door. Over time this gives the dog the sense that they can motivate the humans to move faster by barking more. I had one of their guardians go outside to play the part of the guest. Because its a family member, the instinct to rush to the door is eliminated. For this reason I suggested that the family text or call one another before coming home and letting the other person know they would be knocking at the door excitedly so they could practice this exercise. She waited a few moments then started knocking and ringing the door bell like crazy. 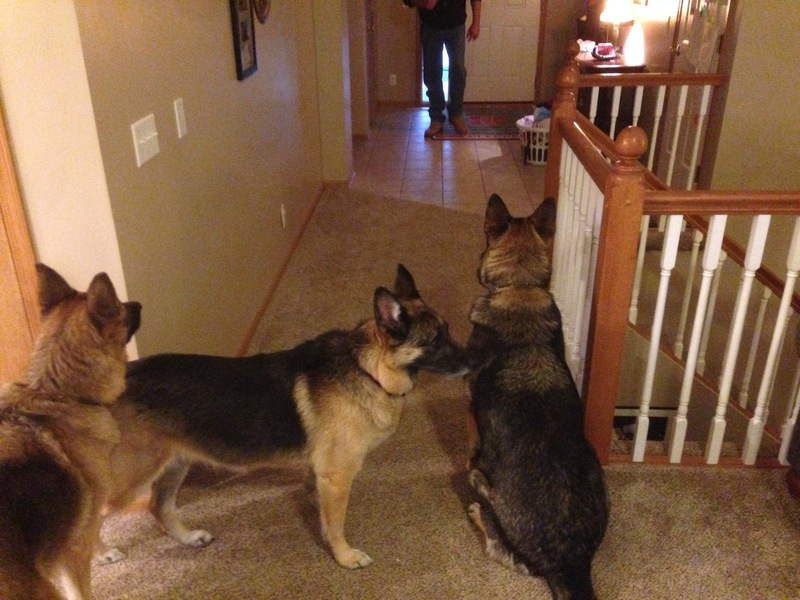 As soon as the dogs heard it, they got up and rushed to the door. I stood up and walked over to the front door at a casual, non-rushed pace. As soon as I got behind the dogs, I turned so the door was at my back and then marched right at Teddy who was the most excited. When you have multiple dogs you need to correct, its easy to get overwhelmed trying to handle them all at once. For this reason I always focus on the most excited / active dog first. I kept marching right at Teddy until he was ten feet away from the front door staying where the carpet met the floor tile. I walked backwards to the door keeping Teddy in front of me. Once I got behind the dogs again, I focused my attention on Charles and repeated the process until he was ten feet away as well. May was in the general area, but as she is nearly blind and was only mimicking the other dogs, I addressed her last. I ignored the barking while conducting this exercise. When a dog is barking and you yell at them, they often interpret that as your agreeing the their barking. Once a dog learns door guarding is no longer their job, the barking usually subsides quite a bit on its own. Once all three dogs were behind the ten foot line I moved them beyond, I walked backwards to the door, keeping the dogs in front of me. When I got to the door, I giggled the door knob a few times as this sound sometimes triggers the dog to come forward. Charles got up when he heard it but after a single correction he stopped and sat back down. I opened the door a crack and waited to see if the dogs started to charge the door again. However these are no dumb blondes, they all stayed behind the line and the barking petered out. I opened the door and let the guardian in. Once the dogs saw who it was, they all started forward so I immediately turned my full attention toward them and rushed at them in a quick march to communicate they needed to move back behind the ten foot boundary I established. Once they got past the line, I immediately stopped moving towards them and walked backwards to the door again. Its important the dogs learn that they need to stay behind the line until given a release. Otherwise they have to wait for the human to pass the boundary before they can engage with them. As only two guardians were there for the session, I had them switch places and repeated the exercise. This time the dogs only barked a few times and were much easier to back away from the door. We repeated the exercise again but this time one of the guardians conducted the exercise and got the same result. When we swapped places again, the dogs only barked once before sitting near the boundary without being corrected or told to do so. When one of the guardians saw this happen, she had a single word response,”wow.” I love it when a client is surprised by how quickly their dog’s behavior changes. As we were wrapping up the exercise walking away from the door, a friend dropped by unannounced. The timing of this arrival couldn’t have been better. The guardian went over and repeated the exercise with the dogs needing little guidance or corrections before they sat down at the boundary to the front door. By the end of the sessions, the dogs were calmer, listening better and showing good confidence in their movement, posture and interaction with their family members. It will take some practice at the door exercise and continued use of the new techniques and methods we went over, but because these are three highly intelligent dogs, it shouldn’t take long before they stop their aggressive barking and charging at the door for good.